I am sure you are all aware of our passion for cycling at b small, we love it so much we wrote a book about it! 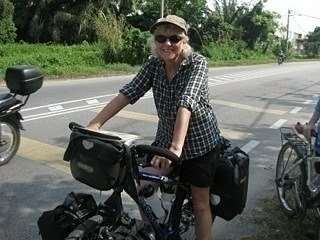 Recently we were at a Cycle Touring Festival weekend and met Ann Wilson who cycled round the world at 60! As it's the last week of the 2016 Tour de France, we asked if she would share some of her adventures with us. I set off from Calais in 2009, on a journey which would take me through 20 countries, cycling more than 10,000 miles around the world. In Eastern Europe I discovered what it was like to be without the luxuries of western life and had to deal with disaster in Bulgaria when my bike was stolen. I bought a replacement and carried on across Turkey until winter snows persuaded me to take the TransAsia Express train to Iran. There I saw the fabulous ruins of Persepolis and experienced the unbeatable hospitality of the Iranian people. I became ill in India but struggled on across this fascinating continent, weaving my way between cows, goats and trucks until I arrived in Kolkata. In Malaysia I succumbed to the parasite which had invaded my body and spent a month living with a Chinese family who nursed me back to health. In Cambodia, I took an unexpected dip in the vast Tonle Sap Lake when I slipped from a jetty, but no harm was done and after visiting the marvels of Angkor Wat, I flew to Seoul in South Korea. Once there, I biked south to take a ferry to Japan and, passing Mount Fuji on the way, cycled to Tokyo to stay with my son for my 60th birthday. The final leg of my trip would be across the United States from west to east. I saw the big skies of Montana and the Great Lakes of Central America and visited my brother in Milwaukee before riding on to Montreal. 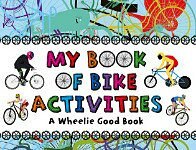 Have you checked out our wonderful book My Book of Biking Activities yet? Packed full of fascinating cycling facts, it is practically spinning with colourful puzzles to solve and practical tips perfect to entertain young cyclists when they're not on their their bikes!